Over the last few months I have managed to get myself through some serious skincare and body care bits, mainly because I've got so much to use so I'm trying to power through it all. Most of these have been emptied over the last 2 months so you can expect another one of these posts coming up soon as well as a makeup edition, too. I'm an oily skinned girl and am prone to a breakout or two every once in a while so this badboy is brilliant at treating them and helping my skin clear up overnight. The non-irritating formula tingles a little bit at first but it soon subsides and leaves skin feeling comfortable and ready for the next step of your night time skincare routine. This came in to my life in one of those Selfridges lucky bags of 2012 - those were a right epic fail - and even though all the other products were rubbish, this was the big winner for me. A loose exfoliator which could be used on it's own with water or with your normal cleanser, it helps get rid of the grime and dirt sitting on your skin without being too abrasive or stripping your skin of natural oils. Every person who gets the odd spot or breakout should have this little bottle in their life because the gel inside it is bloody good! 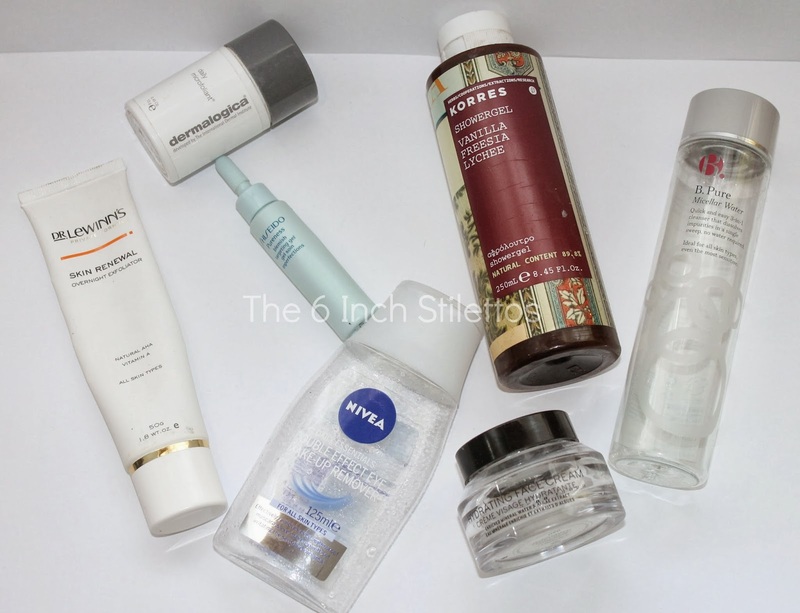 I've tried lots of spot treatment products and, while they might work on small spots, they very rarely are able to tackle a breakout of any kind. This, on the other hand, is great at treating all kinds of spots and breakouts and works pretty much every single time. This tiny bottle lasted me ages so even though it is a bit pricey (£20.00) you get a lot in there because a little goes a long way! I've included this before so won't wax lyrical again but if you don't fancy splashing out on Lancome Bi-Facil every month then get this. It's cheaper and does exactly the same thing. This shower gel was a bit hit and miss in my house because we're all pretty dedicated to Snow Fairy by LUSH. On first sniff, it smelt amazing. On first shower, it smelt great. On second shower, not so much. It's a very strong fragrance so if you're not used to a shower gel that is quite heady and musky then I would definitely stay away from it. As a perfume, this would be fab and I'm sure that it probably is but as a shower gel, it's just a little too full on for my family and I.
I'm never too convinced by makeup brands that do skincare because I personally feel like they should stick to what they know so I tend to avoid them. However, I had to eat my words after trying this face moisturiser because it's actually a gem of a product, especially when used in the summer. It doesn't contain any SPF which is a bit of a downer but a light layer under a light layer of sun block, is just fine. It was fine on my oily skin and didn't lead to any makeup slips or foundation wearing so I'd recommend it for use during the warmer months. I will never repurchase this product. Ever. It smelt funny, left my skin feeling like it had a film and didn't remove all of my makeup. The only reason this is featuring as a product I've used up and didn't see the bin was because I began using it to remove makeup swatches from my hands and arms after photographing them. Are there any products on here that you've tried and love/hate? I want to know!